Nature’s Harvest Puppy is a gently steamed complete food for younger dogs made with chicken & brown rice, formulated to your puppies’ natural diet using only the finest ingredients. We use real chicken that has a high vitamin, protein and fat content to help your puppy develop correctly. Coupled with whole brown rice and vegetables, our puppy food does not contain any of the meat/vegetable derivatives or fillers that are often found in other pet foods. 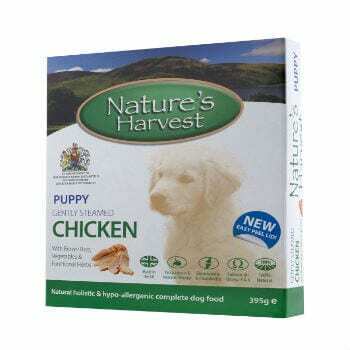 Nature’s Harvest Puppy Chicken & Brown Rice is a complete food available in single trays of 395g or packs of 10*. Begin with the recommendations provided below and adjust to maintain body weight. Your dog’s needs may differ from the guide below due to age, breed & activity level. Always feed to maintain a lean active condition. Provide your dog with a clean container of fresh water daily. If your dog has not eaten Nature’s Harvest Puppy Chicken & Brown Rice before, it is best to introduce it slowly over a couple of days. Feed as a complete meal or with Nature’s Harvest Wheat Gluten Free Mixer. Always consult your vet with any health questions. Store in a cool dry place away from direct sunlight. Feed at room temperature. Once opened cover and store tray in the fridge for up to 48 hours. This product can be microwaved for 30-60 seconds before serving, it should then be consumed within 20 minutes (but ensure that it is not too hot). This product may be portioned for use as required and frozen if desired. The portion of the product frozen should be transferred to a separate container or well wrapped in either foil or plastic. Care must be taken to ensure the product is fully defrosted to ambient temperature prior to feeding. If using a microwave to defrost the food, ensure no ‘hot spots’ are present in the food prior to feeding.